NOTE: This warranty information only covers manufacturer coverage of the product. Additional coverage may be included in the sale price of your lift chair. Please consult our product experts for more details. Classic Collection: Pride's classic lift chairs come with a 2-year limited warranty and lifetime coverage of the lift mechanism. Elegance Collection and Heritage Collection: These Pride lift recliners come with a 7-year limited warranty and lifetime coverage of the lift mechanism. Specialty Collection: The warranties on these lift chairs vary from model to model. 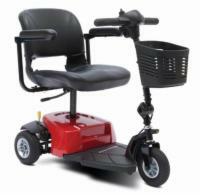 For more information, view the product descriptions for the Specialty Collection lift chairs. LIFETIME WARRANTY: Pride offers a lifetime warranty on the steel lift mechanism. Pride warrants that the steel lift mechanism on your Pride Lift Chair will be free from defects under normal use and service for as long as the chair is in use by the original owner. This lifetime warranty covers the steel lift mechanism against metal fatigue, defective welds, and bushings. Pride reserves the right to replace only the part of the steel lift mechanism that may be defective. TWO-YEAR LIMITED WARRANTY: For two (2) years from the date of purchase, Pride will repair or replace at their option to the original purchaser any of the following parts found upon examination by an authorized representative of Pride to be defective in material and/or workmanship: Wood Frame, Motor, Hand Control, Scissor Mechanisms. SEVEN-YEAR PRO-RATED WARRANTY: For the first three (3) years from the date of purchase, Pride will repair or replace at their option to the original purchaser any of the following parts found upon examination by an authorized representative of Pride to be defective in material and/or workmanship: Wood Frame, Motor, Hand Control, Scissor Mechanisms. For four (4) additional years, a pro-rated warranty will be made available for the following parts: Motor, Hand Control. Pride will warrant these components with the following pro-rated schedule: Fourth year: 35% off suggested retail price. Fifth year: 25% off suggested retail price. Sixth year: 15% off suggested retail price. Seventh year: 5% off suggested retail price.